Legendary composer George Gershwin died in 1937, but that has not stopped the creation of three major book musicals featuring his songs in relatively recent years. The best of them is surely 1992’s Crazy for You, a clever romantic comedy with the emphasis on the comedy, thanks to a jokey script by Ken Ludwig. But to work, the show needs a charismatic hoofer in the male lead. The Wick Theatre certainly has that in four-time Carbonell Award winner Matt Loehr, who flabbergasted audiences in the role at the Maltz Jupiter Theatre eight years ago. As if anyone doubted it, Loehr proves that his earlier triumph as high-finance scion and song-and-dance man wannabe, Bobby Child, was no fluke. 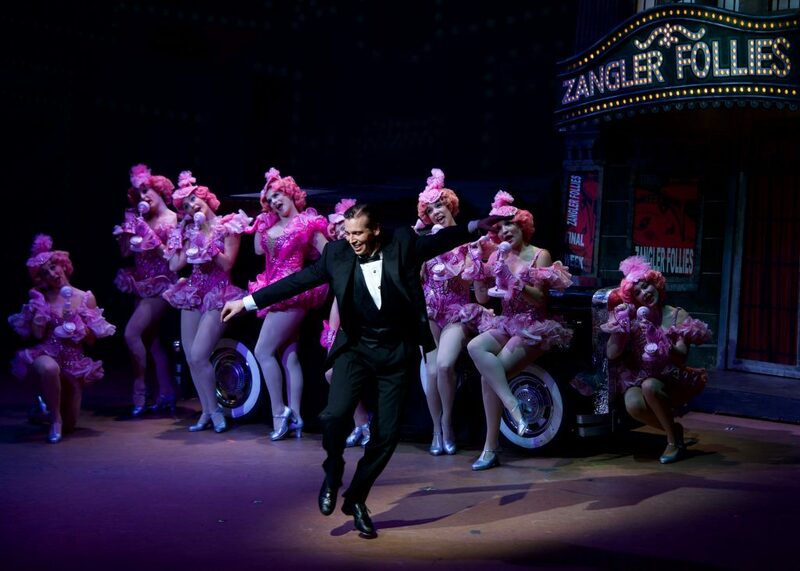 From his opening tap number with a bevy of impossibly pink-clad chorus girls to “I Can’t Be Bothered Now,” through a few graceful faux-Astaire-and-Rogers dances to his frequent physical comedy schtick, this is a knockout performance not to be missed. Exasperated by his indifference to the family banking business, Bobby’s mother sends him out to Dead Rock, Nev., a dying Old West town, to foreclose on its one theater. 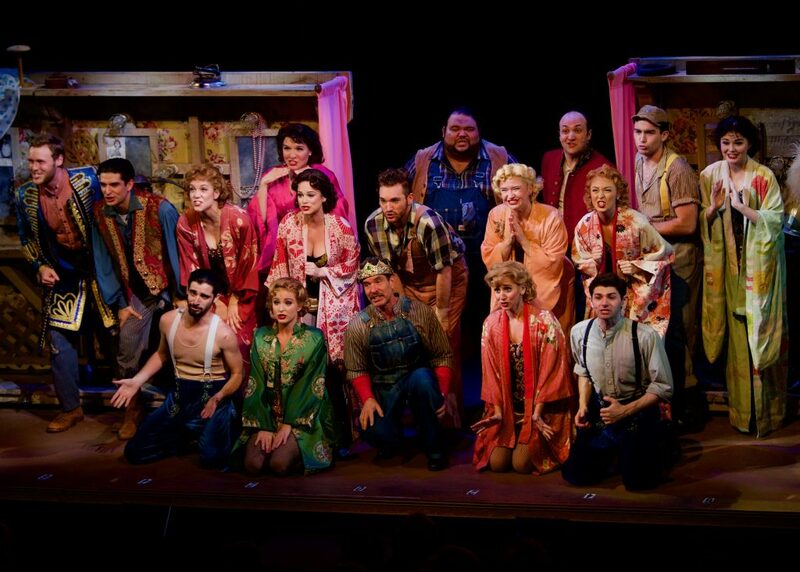 Instead, he is instantly smitten with its owner, spunky cowgirl Polly Baker (luminous Julie Kleiner), whom he convinces to put on a show to save the playhouse. But Polly takes an instant dislike to Bobby, preferring Broadway impresario Bela Zangler, whom she has never met. So Bobby impersonates Zangler to woo Polly and, wouldn’t you know it, before long the real Zangler shows up in Dead Rock. If all this sounds vaguely familiar, it approximates Ludwig’s Lend Me a Tenor, which was about a mild-mannered schlemiel who proves himself through a disguise and mistaken identity. Still, the inevitable meeting of the two Zanglers (Loehr and Wayne LeGette) inspires a clever, precision mirror-image number (“What Causes That?”). Other musical highlights (this production uses recorded music) include a percussive extravaganza to “I Got Rhythm” and the female ensemble turned into human musical instruments on “Slap That Bass,” devised and ably drilled by choreographer David Wanstreet. 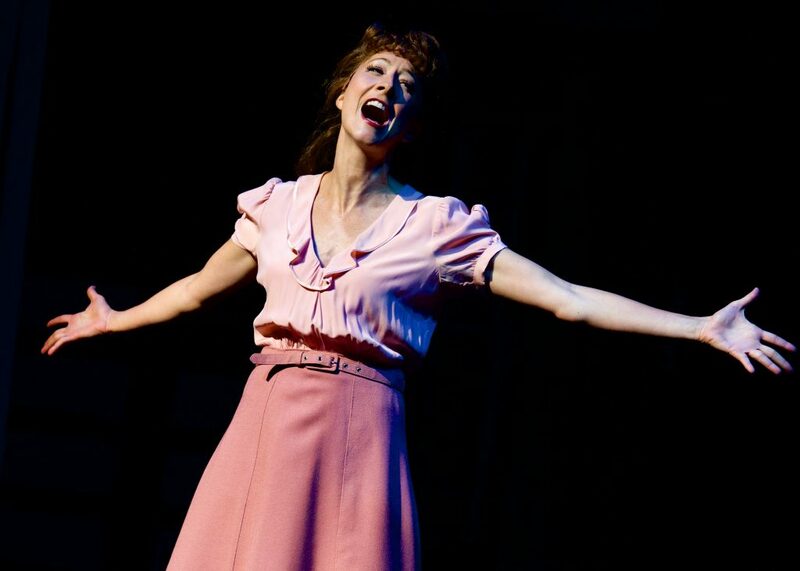 Kleiner handles her love ballads (“Someone to Watch Over Me” and “But Not For Me”) achingly well and she has palpable chemistry with Loehr, with whom she co-starred three seasons ago in Me and My Girl at the Maltz. The Wick should start thinking of other shows – like next season’s The Music Man – that would be well-suited for the two of them. The eye-popping scenery is a hybrid of Robin Wagner’s original Broadway designs and Josieu T. Jean’s projections. Jim Buff seems to have raided the Wick warehouse for the costumes, which look to be adaptations of William Ivey Long’s original Tony-winning designs. Whoever deserves the credit, this is as stunning a physical production as this theater has ever assembled in its six years of operation. Crazy for You is a complex show that has to look easy, and that is exactly the directorial touch that the reliable Norb Joerder brings to the production. It helps that he has the services of Loehr, who glides and clowns his way through the proceedings, but the entire Wick show is a triumph. CRAZY FOR YOU, Wick Theatre, 7901 N. Federal Highway, Boca Raton. Through Sunday, April 14. $95-$75. (561) 995-2333 or visit thewick.org.